T he vibrant patch of colour that rises from the aridness of Egyptian Sand is Cairo. Flourished under the blessing of the Nile and constructed with blood and toil for centuries, she was the pretty girl everyone wanted. The British wanted her. The French wanted her. The Arabs won her and transformed her. Today at her heart in Tahrir Square, the magnificent Cairo Museum or Egyptian Museum showcases all the glorious days. Built in 1901, Cairo Museum is the largest treasure trove of Egyptian antiquities in the world. Walking by the mummies laying in shadowy sarcophagus, illuminated busts of formidable kings and emperors and thousands of coins, jewellery and vases is a sight once seen, never forgotten. The archaeological dig for ancient antiquities commenced when the European traders and conquerors started setting foot in Egypt. Many significant specimens of Egyptian history have been lost from Egypt such as Rosetta Stone, artefacts of Queen Hatsheput’s Temple, nine-foot tall head of “Young Memnon”, and many more. Still, the Cairo Museum can pride itself on possessing the Tomb of Tutankhamen, one of the most groundbreaking archaeological discoveries of all times. 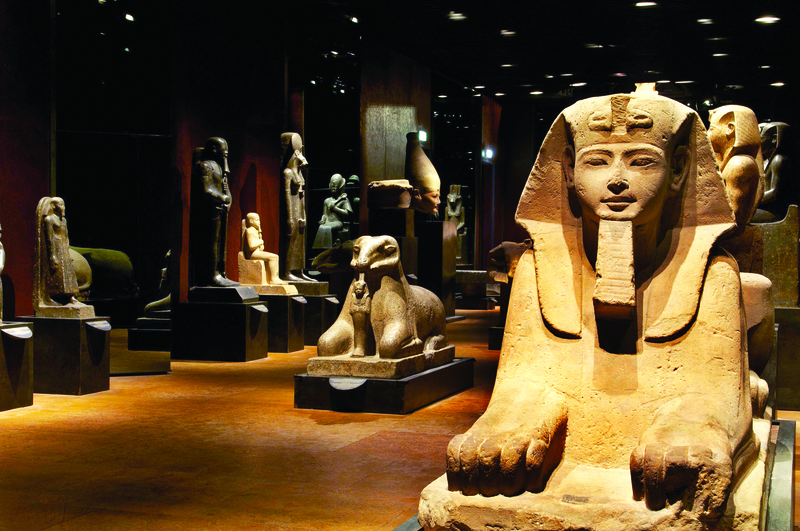 More than 100,000 artefacts are wedged into the 15,000 sq metres of Cairo Museum. The overflow of the archaeological findings made the Ministry of Antiquities build another USD 795 million museum in Giza of Greater Cairo. At first sight, visitors are greeted with a majestic view of neo-classical architecture of the museum. It may take a fortnight to cover everything on display but three to four days have to be dedicated to experience the wonder that Egypt was. Tutankhamen’s tomb is a huge crowd-puller here and the mystery surrounding it justifies that. Discovered by Howard Carter in 1922, the teenage pharaoh’s grave contents such as pure gold mask, furniture and sarcophagus are a dazzling stow of wealth. The mask of Tutankhamen is the flagbearer of Egyptian royalty. Many other attractions include statue of King Amenhotep II and Queen Tiye located in the central gallery, statue of Khafre from his valley temple, a large statuary group of Amenhotep III and his wife(grandparents of Tutankhamen), two colossal statues of Ptah from the temple complex of Ramses II at Memphis. Apart from historic findings, there are other attractions like paintings of Meidum Geese and breathtaking hieroglyphics which are notable for their aesthetic value. 1) In 1835, the ruler of Egypt, Muhammed Ali banned sending Pharaonic pieces out of Egypt. The thought of a central museum started from then. 2) An Italian construction company, Garozzo-Zaffarani built the museum in 1901. 3) The basement of the museum also contains numerous pieces of historical objects which are open to the public. 4) When the mummy of King Ramses II was being taken to France for restoration, the dead king was issued a passport with profession listed as ‘King (Deceased)’.